Though long anticipated, our late afternoon arrival in Kathmandu was an immediate culture shock. Kathmandu is a place that is incessantly busy; the air is thick and you can constantly hear cars beeping or dogs barking. The cleanliness, order, and clean air of Switzerland offered a great contrast to our experience in Nepal. I was reminded of the privileged lifestyle I lead and how much I am sheltered. In contrast, Kathmandu is a city that has suffered a lot. This was continually evident whether from the earthquake damage to the thick smog in the air or the lack of basic supplies. Despite all of this it is incredibly easy to love Kathmandu: the people are friendly; the building are brightly colored; prayer flags strung up between homes. Not only this but we had the luck to see it at a prime time: Holi day. This meant that we experienced an important and colorful part of Nepali culture which was shared so wholeheartedly with us. The people at the SASS orphanage definitely left the greatest impression on me. They are incredibly welcoming and accommodating. They definitely taught me at least as much, if not more, than I taught any of the children. The children’s outlook on life and the positivity they showed was infectious and gave me a sense of perspective for my own life. They wanted you to experience their cultures and lives as well as learn about yours. I have gained a second family and people I will never forget. SASS is definitely an organisation I would love to work with again. Though the trip was challenging and at times even testing, I wouldn’t change this. It made me more resilient as a person and I can only hope I was helpful to the Sagarmatha orphanage. I am determined that this will not be a once in a lifetime experience. A big thank you to the Sherpa family and to everyone who contributing to making this experience such a special opportunity for us. In March 2013, a group of about 40 students and teachers from the International School of Geneva (La Châtaigneraie) went to Kathmandu for 10 days. The mission of April 2012 was made up of six individuals most of whom were going to Nepal for the first time. These people went to Kathmandu between 27 March and 10 April to meet the children of Sagarmatha and evaluate their needs. Francis Laune, founder and co-director of the Sagarmatha center, took care of the management of the activities and each visitor participated according to their abilities. Carinne Musset, a hairdresser, proposed haircuts to the children, called energetic haircuts. Catherine Revaz and Anne Kerisel photographed and filmed the children for the Sagarmatha website. And finally, Philippe Musset, who is in charge of the restaurant at the International School of Geneva, took care of improvements in the cooking area of the orphanage. Shelves were installed to stock supplies, rice and food. The old cooker whose toxic fumes from the kerosene it used was replaced by better quality equipment more suited to the needs of the children. The plans for the new dining hall and a new kitchen were also drawn up with Francis and the management team of the center. The first bricks of the construction were laid down in July. The mission also enabled them to take care of other needs that were assessed on-site such as shoes and clothes, English books, supplies of vitamins and medicine, toys. The latter were particularly appreciated by the children! It’s through all these projects and activities that close ties we created between the orphans and all the participants of the 2012 mission. This was so successful that they have already all booked their tickets back to Sagarmatha in 2013! 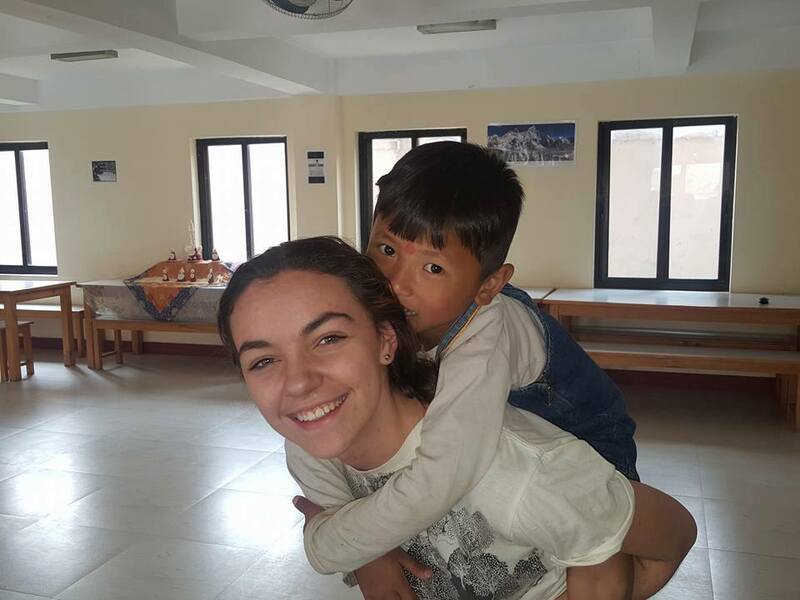 Twenty-eight students and four teachers from the International School of Geneva (La Châtaigneraie) went to Kathmandu from 8 to 20 April to meet the children of the orphanage and evaluate their needs. Bring school supplies, bags, notebooks, pens and books to the children. Participate in managing the finances for the coming school year. Ten laptops were brought for the children so that they can benefit from the most recent technology to increase their knowledge through use of the internet. Out of these ten computers, five were offered to the children of the orphanage and five others to another school in Solukhumbu, a remote region of Nepal. Each student had the possibility of participating in one or more of the proposed projects. They could choose from work such as painting the front doors of the orphanage, the hall and the stairs of the house, repairing the basketball backboard, purchasing toiletry kits for all the children, organizing drawing sessions, musical lessons and games, purchasing a television and organizing a big party for the children. The mission also evaluated other needs on-site and took care of getting things like shoes, clothes, individual lockers, supplies, vitamins and medicine. Strong bonds were created between the youth of Nepal and Switzerland. The visit was one that will remain unforgettable for all.